The bark of most pines is thick and scaly, but some species have thin, flaky bark. The branches are produced in regular “pseudo whorls”, actually a very tight spiral but appearing like a ring of branches arising from the same point. 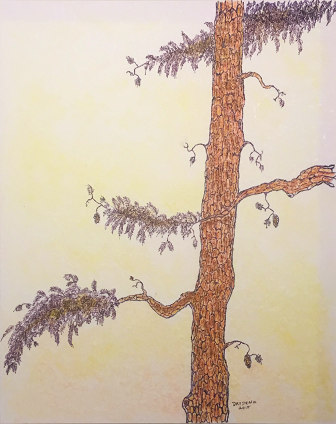 This image is a watercolor by David Dryden of a gnarly pine tree.